Ships to: UK, Canada, Australia, France, Germany. Please provide your postal code and I will estimate shipping. DESCRIPTION: GOWN SHOWN IS FOR SAMPLE PURPOSES ONLY - NOT FOR RETAIL. Each gown we create is a one-of-a-kind custom-made couture gown. We do not make multiple duplicates of any gown shown in our store. Use this gown as inspiration in terms of style, but your gown will be individually customized with embroidered and embellishment - Some limitations apply. © 2015 - 2018 Designs From Time. All Rights Reserved. The unauthorized copying, or reproduction in any form, is strictly prohibited. 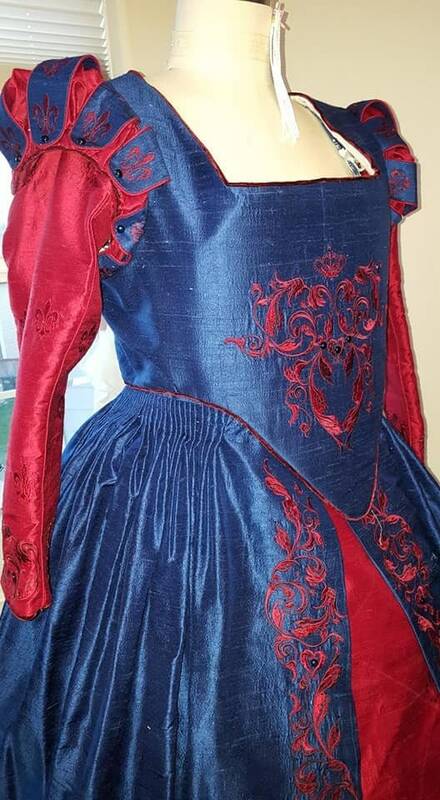 - Bodice with custom paned upper sleeves. - Fitted sleeves with hand-made piping and matching lining. - 4 to 5 panel skirt, hand cartridge pleated. 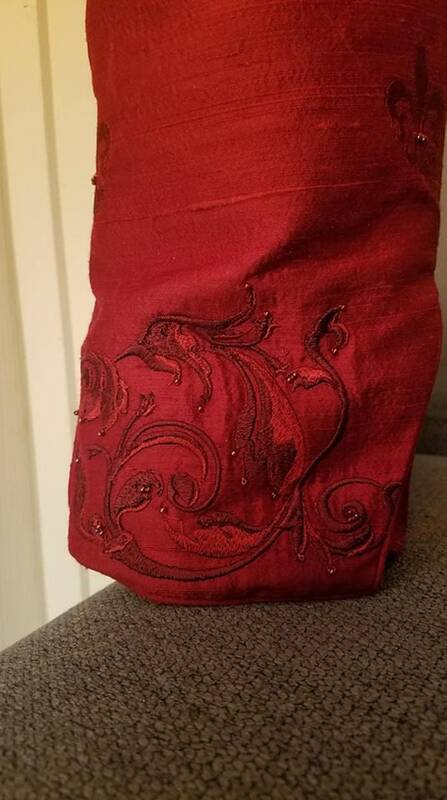 - Silks or Silk blends WILL require hem guards: Add $60 to the listed labor fees. - Beading and Pearling Fees: Glass beads and authentic freshwater pearls fetch a fee of $50 per strand to apply. This gown took 14 strands and 80+ hours to hand sew beads and pearls. Beading/pearling fees for each gown is dependent upon the embroidery or trims chosen. Average gown uses 5 strands and fetches labor fees of approximately $250. These fees are non-negotiable. $250 for 80 hours of labor breaks down to approximately $3.13 an hour and is a HUGE discount that plunges far beneath the minimum hourly wage of $10 to $15 an hour in the USA! Beading fees, if estimated using the current minimum wage of $10 an hour, would normally fetch a fee of $800, which is nearly the entire cost to construct the gown. Therefore, labor fees for beading and pearling are firm and non-negotiable and will be added to your final billing statement. 7 yards of Cotton 50 to 56 inches wide for flat lining skirt panels If you choose silk or silk brocade. (9 yards if cotton fabric is 45 inches wide). 1/4 yard silk or silk velvet (for shoulder scallops or ruching). 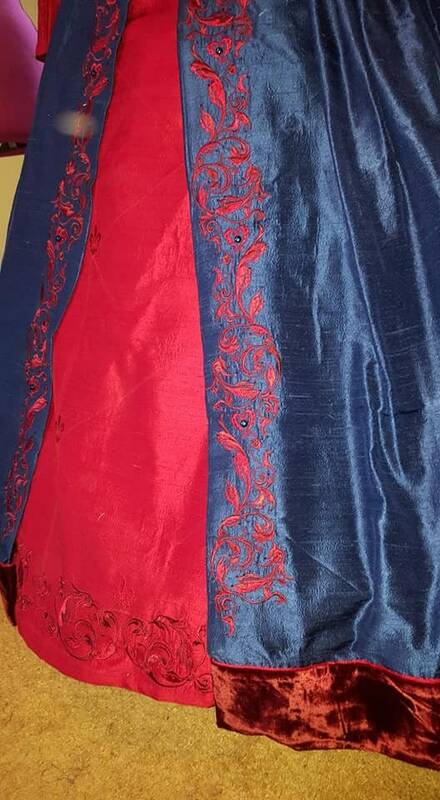 3 yards of silk velvet or cotton velveteen. Only necessary if gown is made of silk brocades or plain silks. Without it, your hem will become horribly frayed! Therefore, hemguards are highly recommended for silks. If you choose not to include them, DFT will not be held liable for any damage to the hem that will result from wear. 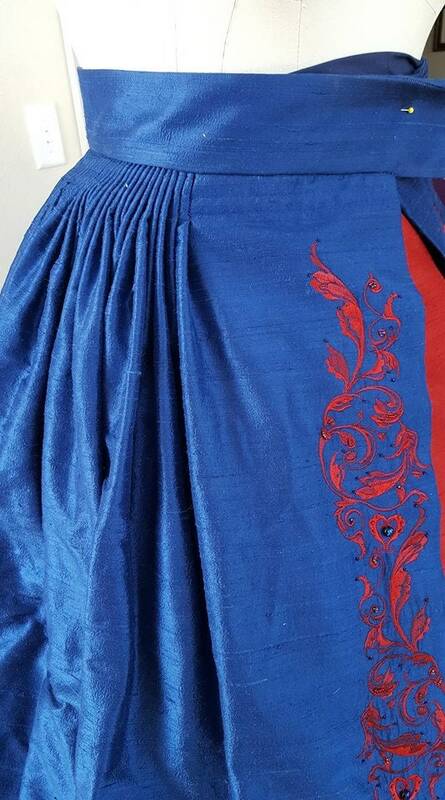 10 yards decorative trim at the intersection of the hemguards and the skirt proper. 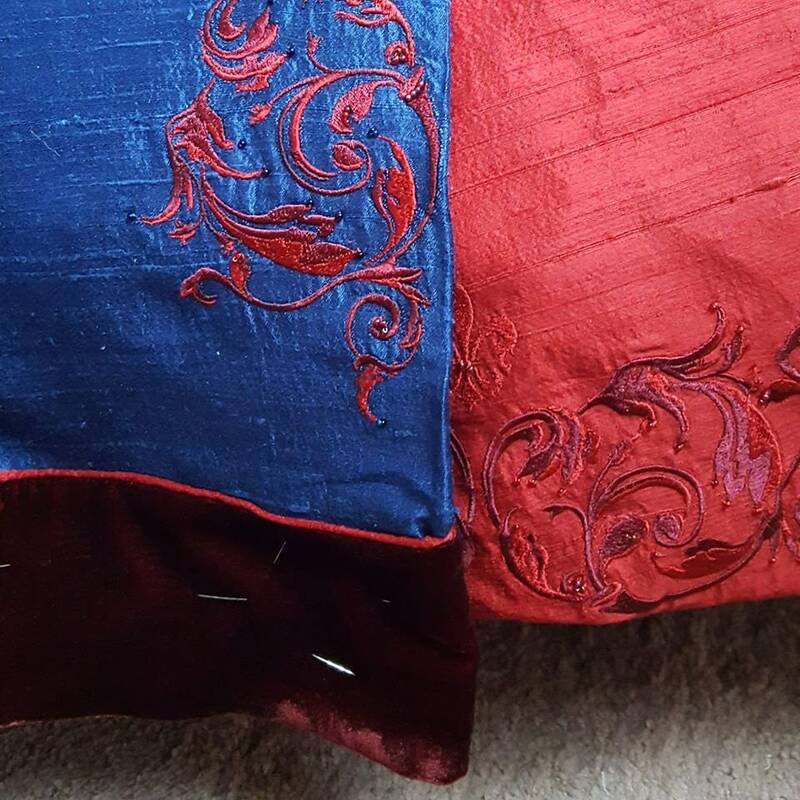 For hand-made piping for the hemguard intersection rather than trims, add another 1.5 yards of silk - or bias cut silk in a contrasting color can be purchased. COST BREAKDOWN: Calculated for the EXACT gown as shown in the listing; however, choosing a different embroidery pattern and subtracting the amount of pearls on the sleeves, etc., can LOWER THE COST. **Non-refundable 30% deposit is required to hold a spot on my calendar. - Please check my availability before ordering. My calendar is often filled out a year in advance so there will be a delay even for gowns paid in full. PLEASE READ! I take (and fill) orders for gowns, coats, an ensembles on a First Come, First Served basis, no matter if paid in full at the time of purchase and regardless of the 9 to 10 week timeline listed for turn-around. Etsy does not provide the 3 - 4month option that I require for construction. *** Hand-made items will have slight imperfections.